For the Peruvian rice dish, see Juane. This name uses Spanish naming customs: the first or paternal family name is Aristizábal and the second or maternal family name is Vásquez. 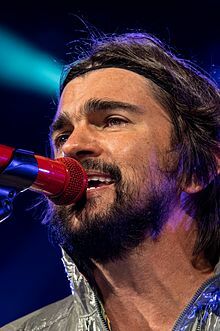 Juan Esteban Aristizábal Vásquez (born August 9, 1972), known professionally as Juanes, is a Colombian musician who was a member of the rock band Ekhymosis and is now a solo artist. In 2000, his solo debut album Fíjate Bien won three Latin Grammy Awards. According to his record label, Juanes has sold more than 15 million albums worldwide. Raised in Colombia, Juanes began playing piano at age two. 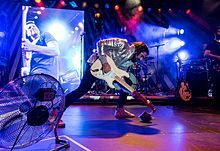 When Juanes was 17, he started his first band, Ekhymosis, in 1988, which went on to release Eight albums, achieving recognition in his native country of Colombia. The track "Dos" from the album Niño Gigante in 1992 was very popular. In 1997 after the band broke up, Juanes continued solo and in 2000 he released the album, Fíjate Bien, which earned him three Latin Grammys. His follow-up album, Un Día Normal, was released in 2000 and was later certified platinum in Guatemala and Uruguay throughout Latin America. Juanes' third album, Mi Sangre (2004), which became an international bestseller, managing to position well in a number of countries around the world, achieved success due to the single "La Camisa Negra". He has since released La Vida... Es Un Ratico (2007) and P.A.R.C.E. (2010). On May 29, 2012 Juanes released the album Juanes MTV Unplugged. According to his label, Universal Music, Juanes has won, among others, twenty Latin Grammy Awards (5 wins in the Grammy Awards on November 13, 2008) and two Grammy Awards. Juanes received the BMI President's Award at the 2010 BMI Latin Awards. Presented By James Edward Taylor  Juanes is also known for his humanitarian work, especially with aid for Colombian victims of anti-personnel mines through his NGO Fundacion Mi Sangre. On April 2013, Juanes released an autobiography titled Chasing The Sun in which he tells his story through narratives and pictures. Juanes was born in Carolina del Príncipe, Antioquia, Colombia. When he was seven years old, his father and brothers began to teach him how to play guitar. His passion for the instrument led him to discover simple genres of music such as traditional sounds such as tango and Vallenato, as well as Russian folk music. He grew up in Medellín during the height of drug kingpin Pablo Escobar's reign, when the city had the highest homicide rate in the world. During his childhood, Juanes witnessed a civil war in which hundreds were killed. His cousin was killed by kidnappers, and gunmen also executed a close friend. To add further to Juanes' grief and desperation, his father died from cancer. This period shaped Juanes' social consciousness, saying "Colombia has suffered so much that the only way to go forward is to imagine a better country." As a teenager, Juanes was greatly influenced by rock and metal acts such as The Beatles and Metallica. He started the rock band Ekhymosis in 1988, and it released its debut album, Niño Gigante, that same month. The band released seven studio albums during its career and shared the stage with acts including Alejandro Sanz, Aterciopelados, and Ricky Martin; however in Juanes' words, the band "couldn't get out of Colombia" and remained "very local and confined to the Colombian market." Juanes disbanded the group in 1998 so that he could pursue a solo career. In 2000, Juanes released his solo debut Fíjate Bien (Take a Good Look), produced by Gustavo Santaolalla. The album fared well in Colombia, spending ten weeks at the number one position, but was unsuccessful in other countries. The album earned him three Latin Grammys for Best New Artist, Best Rock Solo Vocal Album, and Best Rock Song, and Juanes performed at the award show. Later that night, Juanes brought demos for over forty new songs to Santaolalla's studio, ready to begin work on another album. The follow-up, Un Día Normal (A Normal Day), also produced by Gustavo Santaolalla who signed him with his first solo album, was released in 2002 and was highly successful in Latin America. The album was certified gold in Colombia during its first day of sales and was certified platinum and multi-platinum in countries including Colombia, Mexico, and Spain. The album spent 92 weeks in the top ten of Billboard's Top Latin Albums chart, setting a new record, and spent a total of two years on the chart. The album was released after the eligibility deadlines for the 2002 Latin Grammy Awards, but the advance airdate for the lead single, "A Dios le Pido" ("To God I Pray"), allowed it to be nominated for three awards and win Best Rock Song. "A Dios le Pido" topped the singles charts of twelve countries and spent 47 consecutive weeks on the Billboard Hot Latin Tracks. The album also featured "Fotografía" ("Photograph"), a duet with Portuguese Canadian pop singer Nelly Furtado about the isolation between lovers. Juanes later worked with Furtado on a remix of "Powerless (Say What You Want)", the lead single from her 2003 album Folklore, and on "Te busqué" ("I Looked for You"), a single from her 2006 album Loose. Juanes won the most awards at the 2003 Latin Grammy Awards, where he won each of the 5 awards for which he had been nominated, including Song of the Year, Record of the Year, and Album of the Year. The lead single from Mi sangre. Mi Sangre (My Blood), was released in September 2004 and debuted at number one on the Billboard Top Latin Albums. The album produced three consecutive number one singles, which held the top chart position for a combined 6 months. The album's third single, "La Camisa Negra" ("The Black Shirt"), was used in Italy in support of neo-fascism by relating it to the uniform used under the regime of Benito Mussolini. In response, left-wing media network Indymedia called for a boycott of the song. Juanes later stated that "'La Camisa Negra' has got nothing to do with fascism or Mussolini... People can interpret music in all kinds of ways I guess." At the 2005 Latin Grammy Awards, Juanes won three additional awards to his nine previous Grammy awards. He took the award for Best Rock Song for "Nada Valgo Sin Tu Amor" ("I am Worthless Without Your Love"), Best Rock Solo Album for Mi Sangre and Best Music Video for "Volverte a Ver" ("To See You Again"). On December 9, 2005, Juanes performed "La camisa negra" at an international gala in Germany celebrating the 2006 FIFA World Cup Final Draw evening. In 2006, he recorded a duet of "The Shadow of Your Smile" with Tony Bennett for Bennett's Duets: an American Classic. In June 2006, Juanes began a year-long sabbatical to spend time with his wife, model Karen Martínez, and their daughters Luna and Paloma. He was working on an album that was released on October 23, 2007. When asked about the possibility of recording an album in English, Juanes responded, "singing in Spanish is very important because it's the language in which I think and feel. I respect people that sing in English, but for now I'll keep my Spanish." Juanes planned to launch his own music label, named 4J, in October 2007, to be distributed by the Universal Music Group. He was also working on a new album, titled La Vida... Es Un Ratico (Life is a Little Moment). La Vida... Es Un Ratico was released on October 23, 2007 with the first single being "Me Enamora" (I fall in love). The second single was "Gotas de Agua Dulce" (drops of sweet water), and the third single became the vallenato fusion of "Tres" (three). On December 11, 2007, Juanes performed at the Nobel Peace Prize Concert in Oslo, Norway together with a variety of artists, which was broadcast live to over 100 countries. On November 24, 2008, Juanes re-released the album as "La vida... es un ratico (en vivo)" [Deluxe Edition][2 CD/DVD Combo]" The album aside the 14 original songs, contains two previously unreleased songs: "Falsas Palabras" (false words) and "Odio Por Amor" (hate for love) which is also the current single. This new re-edition also includes seven live versions of songs played during his U.S. La Vida Tour. As another bonus added, Juanes also included a duet of his song "Hoy Me Voy" (today I leave) with singer Colbie Caillat. The DVD contains the music videos of the four singles of the cd as well as a few live video recordings of the US tour. In 2010, Juanes performed in the 2010 FIFA World Cup Kickoff Concert, as well as the Macy's Thanksgiving Day Parade in New York. In addition, he released his album P.A.R.C.E. which featured the #1 Billboard hit Yerbatero and the top-ten hit Y No Regresas. February 17, Juanes performed live on the third single from their fifth studio album Regalito in the delivery of the Premios Lo Nuestro. The album has sold 1 million copies worldwide. In February 2012, the Colombian singer Juanes took the stage at Juanes MTV Unplugged to record a live album at the direction of Juan Luis Guerra. On March 6, Juanes will release "La Señal" as an unreleased song from his Unplugged. On March 11, 2014 Juanes released his sixth studio album by Universal Music Latino Loco de amor. It is his first studio album since P.A.R.C.E. (2010). At the Latin Grammy Awards of 2014, the album won the Best Pop/Rock Album. Loco de Amor was nominated for Lo Nuestro Award for Pop Album of the Year. It was nominated for a Grammy Award for Best Latin Pop Album in 2015. Movies can now be added to Juanes career, with his contributions to the recent animated film Ferdinand. In that production, he both wrote the original score "Lay Your Head On Me" and played the voice of Juan (Nina's father). Juanes has said that: "these are your people, young people, people with families, and four or five of them are dying every day." Juanes established the Mi Sangre Foundation to help victims of anti-personnel mines In 2005, he was named by Time as one of the world's 100 most influential people. On November 15, 2005, he was honored at the annual benefit gala for Sir Paul McCartney's Adopt-A-Minefield for his work as a Goodwill Ambassador for United for Colombia, a non-profit organization that raises awareness about the impact of land mines within Colombia. On April 19, 2006, Juanes performed before the European Parliament, as part of a campaign to increase awareness against the use of landmines around the world, including in his native Colombia. He was first singer to perform in the hemicycle where the European Parliament holds its plenary sessions. The Parliament gave a symbolic gift of €2.5 million to demine Colombia and to rehabilitate victims of the landmines. In honor of his work and his music, he was given an escopetarra (a decommissioned AK-47 converted into a guitar) by peace activist César López; he later sold it at a fundraiser in Beverly Hills for US$17,000. Juanes held a benefit concert on May 24, 2006 in conjunction with KLVE and Univision which raised roughly US$350,000 to care for injured children and provide prosthetics, wheelchairs, and land rehabilitation. On July 19, 2006, French Culture Minister Renaud Donnedieu de Vabres awarded Juanes with the highest cultural honor given by France, L'Ordre des Arts et des Lettres, declaring him "Knight in the order of Arts and Letters" for his work in social activism. In December 2006, work began on a recreational park for the rehabilitation of the handicapped named "Parque Juanes de la Paz" in Medellín. The 68,000-square-meter facility will cost COL$10.6 billion, financed in part by the government of Medellín, and is to be completed by May 2007. Going to Cuba is a symbol that it's time to change people's minds, an opportunity to tell the world that people have to change. On August 5, 2009, it was announced that Juanes would hold his second "Peace Without Borders" concert in Havana's storied Plaza de la Revolución on September 20, 2009. Prior to the concert, Juanes received criticism by some in the Cuban-American/Cuban exile community in Miami who believed it would be seen as an act of support for the communist government of Cuba. Juanes expressed in an interview for Univision that he had no affiliation whatsoever to the Cuban government or their political views and that he saw it only as an artistic performance and nothing more. On August 20, 2009, Juanes announced that he had considered canceling the peace concert citing "fears for his safety as well as his family", who reside with him in Miami on Key Biscayne. Juanes closed it along with 15 other Cuban and international artists and with more than one million people attending the concert." Juanes met model/actress Karen Martínez during the filming of his video "Podemos Hacernos Daño". On August 6, 2004, they were married. The couple separated in May 2007, after three years of marriage due to unresolved differences, but reconciled four months later. They have three children together, two daughters: Luna Aristizábal Martínez (born September 6, 2003), Paloma Aristizábal Martínez (born June 2, 2005), and one son, Dante Aristizábal Martínez (born September 12, 2009). Juanes is a vegetarian and currently lives in Key Biscayne, Florida. The Grammy Award is an accolade by the National Academy of Recording Arts and Sciences of the United States to recognize outstanding achievement on the music industry. Juanes has received five nominations and won two. A Latin Grammy Award is an accolade by the Latin Academy of Recording Arts & Sciences to recognize outstanding achievement in the music industry. Juanes has received twenty awards and twenty-eight nominations. ^ a b "Voz de América". Voanews.com (in Spanish). Retrieved July 12, 2017. ^ "Juanes inicia con 'PARCE' un giro hacia un tipo de pop-rock 'más básico' – Noticias internacionales en MSN Latino". msn.com. Archived from the original on July 14, 2011. Retrieved December 8, 2011. ^ "Juanes Receives President's Award at 17th Annual BMI Latin Music Awards". bmi.com. Retrieved October 21, 2010. ^ a b c d e Birchmeier, Jason. "Juanes Biography". Allmusic.com. ^ a b Kraul, Chris (June 14, 2009). "FOREIGN EXCHANGE: Colombia rocker Juanes gives back". Los Angeles Times. Retrieved January 15, 2011. ^ "Juanes Loco De Amor Tour Tickets Onsale NOW". Official site for Juanes. Retrieved February 7, 2016. ^ a b Bonacich, Drago. "Ekhymosis > Biography". Allmusic. Retrieved January 23, 2007. ^ "Hechos en la vida musical de Juanes"[permanent dead link]. Eskpe.eltiempo.terra.com.co Retrieved January 2, 2007. ^ Kamin, Azhariah. "Latin to the core". The Star Online. May 29, 2006. Retrieved January 23, 2007. ^ a b c d "Juanes Biography" Archived March 6, 2007, at the Wayback Machine. Rockero.com. Retrieved January 24, 2007. ^ Susman, Gary. "Trophy Time". Entertainment Weekly. September 19, 2002. Retrieved January 28, 2007. ^ "Juanes on Top with 5 at Latin Grammys". BMI. September 3, 2003. Retrieved January 28, 2007. ^ Zahlaway, Jon. "Juanes to visit the states in early 2006" Archived September 30, 2007, at the Wayback Machine. LiveDaily. November 1, 2005. Retrieved January 28, 2007. ^ a b Latorre, Héctor (January 24, 2006). "Escopetarras: disparando música". BBC World. Retrieved January 31, 2007. ^ Martínez, Daniel. "Juanes en medio de polémica italiana". BBC Mundo. September 3, 2005. Retrieved January 25, 2007. ^ "Neofascistas adoptan como himno 'La camisa negra' de Juanes" Archived March 31, 2007, at the Wayback Machine. Reuters. September 1, 2005. Retrieved from Colombian Indymedia January 25, 2007. ^ a b Wilson, Scott. "From Colombia, Encouraging Sounds". Washington Post. October 14, 2003: page C01. ^ "Rubio, Juanes Earn Billboard Latin Awards" Archived June 10, 2007, at the Wayback Machine. Yahoo! Music. April 28, 2005. Retrieved February 7, 2007. ^ Chris Morris. "Juanes, Sanz, Bebe Win Latin Grammys". The Hollywood Reporter. November 4, 2005. Retrieved from Billboard February 12, 2007. ^ "Final draw: TV coverage to be broadcast in 145 countries". 2006 FIFA World Cup. November 17, 2005. Retrieved February 12, 2007. ^ a b c "Juanes invited Paul McCartney to Colombia" Archived August 26, 2007, at the Wayback Machine. Quepasa. December 3, 2005. Retrieved January 24, 2007. ^ "Juanes Takes Over the World!" Archived September 28, 2007, at the Wayback Machine. Latina.com. Retrieved January 25, 2007. ^ "Juanes's New Album Has a Title". VOY Music. January 29, 2007. Retrieved March 29, 2007. ^ "Latin Grammys 2014: Complete list of nominees and winners". Los Angeles Times. Tribune Publishing. August 5, 2015. ^ "Colombia sin minas Events Raise $350,000 For Children Victimized By Landmines In Colombia" Archived December 31, 2006, at the Wayback Machine. United for Colombia. June 1, 2006. Retrieved January 25, 2007. ^ "TIME Magazine Celebrates New TIME 100 List of Most Influential People With Star-Studded Event April 19th". Time. April 15, 2005. Retrieved January 24, 2007. ^ "Mine Action in Colombia Archived December 9, 2006, at the Wayback Machine. Adopt-A-Minefield. Retrieved January 25, 2007. ^ "EP and Juanes say 'no' to landmines" Archived October 20, 2006, at the Wayback Machine. European Parliament. April 20, 2006. Retrieved January 24, 2007. ^ a b "After concert gave by Juanes, the European Parliament donate 2.5 million of Euros". Colombian Air Force. April 20, 2006. Retrieved January 24, 2007. ^ "Juanes To Be Knighted". Global Rhythm. July 17, 2006. Retrieved January 24, 2007. ^ a b "Works Begin on Juanes’ Park". VOY Music. December 25, 2006. Retrieved January 25, 2007. ^ "Colombian Singer Juanes, Wife Separate". People. May 25, 2007. Retrieved January 20, 2011. ^ Graglia, Diego (October 10, 2007). "Temporary breakup fuels Juanes' new CD". NY Daily News. Retrieved January 20, 2011. ^ "Juanes: En síntesis". People en Español. June 23, 2013. Retrieved June 23, 2013. ^ "Las vacaciones de Juanes y su familia en Aruba". Shock.com. August 13, 2012. Retrieved June 23, 2013. ^ "Nació Dante, el tercer hijo de Juanes". WRadio. September 12, 2009. Retrieved June 23, 2013. ^ Rodas, CelesteK (March 7, 2014). "Juanes: I Just Want to Find Balance in My Life". Que Rica Vida. Archived from the original on August 5, 2014. Retrieved June 15, 2014. ^ "Juanes | Euskera| Juanes canta en euskera junto a Kepa Junkera". Canales.diariovasco.com. January 1, 2009. Retrieved October 13, 2010. Wikimedia Commons has media related to Juanes.